Can 'Sequester' Have a Natal Horoscope? Horoscope: 'Sequester' proposal; Hour of Mercury, in 10th house of Career and Public Status at a critical-crisis 29th degree, conjunct Royal Star Regulus (success if revenge is avoided but it seldom if ever is avoided in Washington DC); Ascendant 14Sco29 indicating that treachery, big business, and transformation are afoot with Mars as chart-ruler and powerful, wealthy Pluto as sub-ruler of the sequester proposal. Planet Mars 25Gem32 is posited in 8th house of Debt, Credit, Shared Resources, Corporations, and Big Business along with the Moon 26Gem21, both in the sign of duplicity; Mars also rules the 6th house of Military Service, Work, Health, and our Daily Rounds which will be much affected by ham-fisted sequestration cuts as of March 1st, if implemented, due to job losses, unpaid furloughs, and other problems. 'Nice' going, Washington politicians. Blog Note: today I'm getting the tiresome 'long-running script errors' message more than usual from Blogger so this post is like typing in molasses and will be truncated when my patience runs out! In 2nd house lies the North Node (NN) of the Moon @22Sag51, ruled by Jupiter and conjunct Fixed Star Ras Alhague which indicates a path of balance-creation in economic matters. Yes, America's lopsided, much-touted "income inequality" could use a better balance but are untargeted sequester cuts a good way to start? There is a proposal in Congress for the president to have discretion in which departments and programs get their funding sliced but some Republicans don't want to give the president "more power"! And so the current transit of powerful Pluto opposing US natal Sun (power struggles) continues as does the rebellious, protesting Uranus-Pluto square, here 1A03, which issues from their Great Conjunction/s of the mid-1960s. And note that yesterday Supreme Court Justice Scalia called Voting Rights (gained in 1965) as being no more than an "entitlement"! Another important chart factor is sequester's Mercury (plans, proposals, deals, agreements, etc) opposing obfuscating Neptune 00Pis12 Rx in 4th house (the Foundation or End of the Matter.) We find in the news many corporate mergers taking place, or wanting to, since at least 2012, and as you know, Neptune is the planet with a strong urge to merge. That US consumers will benefit from big mergers is extremely doubtful. See Inside the World's Biggest Airline Merger. And don't forget the jolly news that JPMorgan Chase's Jamie Dimon is "richer than you," as he cheekily points out something we already know. Now when trade and commerce Mercury, a trickster when he takes a notion, opposes veiling, often falsifying Neptune (media, the masses), clear thinking takes a holiday and we seldom 'get what we see' or are shown--here, by Washington. Dangerous ideas swirl about and business activities, negotiations, and financial ventures and proposals are not well favored. Cautious and moderate behavior is advised yet as we've seen since President Obama took office in 2009, certain actors upon the Capitol Hill stage are determined to throw caution to the wind, score ideological points, and dance to the tune of their billionaire tax-avoiding backers who have no loyalty to America, or to The Union of our States. Crashing the US economy (again) and bringing even more suffering to the American people is a small price to pay, they think, for gaining their sorry objectives. Bitter resentments (Sun inconjunct Pluto), plus, overpromising, manipulation, wheeler-dealing, and truth-bending (Sun square Jupiter) are shown in the horoscope and thus the financial situation as well. And with transit Venus opposing US natal Pluto 27Cap33 Rx (in 2nd house of the National Treasury in our nation's 'Sibly' natal chart), we've been feeling and experiencing the obsession, envy, jealousy, and cut-throat competition this influence 'inspires'. Mistrust riddles alliances and joint ventures as power struggles ensue, plus, the Venus-Pluto pairing relates to matters such as bankruptcy. Past slights which are unconnected to current conditions blow up the gestures of others into huge grievances (ex: Senators McCain and Graham v. Chuck Hagel as Secretary of Defense, and the general Republican opposition to everything that is Obama)--but of course, Democrats can behave this way, too, as they have in the past. For as 'they' always like to say: payback is Hades. As you see from taskmaster and legislator Saturn's degree, the 'sequester' was presented to Harry Reid during the period of America's Saturn Return (14Lib48) which perfected three times on December 3, 2010, March 22, 2011, and August 28, 2011. And July 27, 2011 was mere 6 days after our still-current Mars Return (21Gem22) denoting a new two-year cycle of activity and goal-planning with the cycle beginning on July 21, 2011; our nation's next Mars Return is due on June 30, 2013, just before Independence Day 2013. 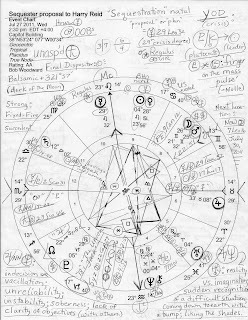 The Goal (MC) is apparently related to leadership with Leo at the WHY" Point of the chart, and royal Leo's ruler, the Sun 4Leo23 (the leader) is between President Obama's natal Mercury and Sun in Leo. This seems to support Mr. Woodward's assertion that the idea for 'sequester' cuts originated in the White House. It could also indicate that sequestration cuts 'across the board' are what Washington intended all along, or were thought to be a way to maneuver and maintain control (rulership) of the dialogue concerning their haphazard, play-acting budget negotiations. 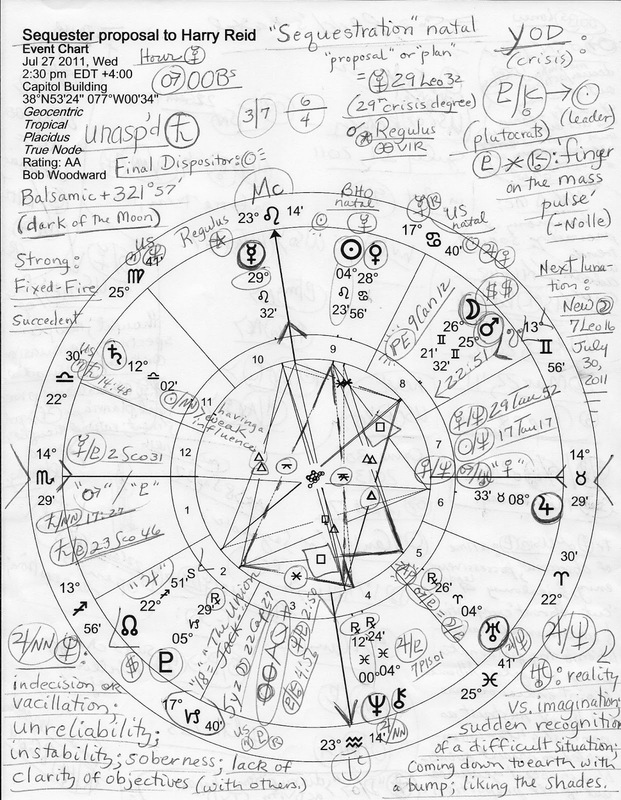 Do you see the YOD pattern of crisis, special task, and turning point with Pluto sextile Chiron (pluocrats, exploitation, oppression, racism, etc) at its base, pointing toward the Sun (president)? To me this looks as if white supremacists, international bankers, and other shot-calling corporatists are making punishing demands and pressuring (inconjuncts to Sun) the president to implement austerity and other measures even as Mars conjoins SN (the Tail of The Dragon, a Saturnian point of separation.) Contentious Mars was recently conjoined by the Moon (the public) indicating that austerity is out of harmony with current societal norms and sentiments and will cause more grief than improvement. Austerity measures will not decrease the deficit or lead to job growth! Additionally, Mars conjunct SN, often a signifier for violence and/or revolution, represents those who act upon their own decisions with no regard for the needs or desires of others. Plus, Moon-Mars denotes hotheads and those who disrupt--here in 8th house matters, as already mentioned. Jupiter-Neptune, the speculator-wastrel-fraudster pair, point to radical utopian Uranus Rx in Mars-ruled Aries in the 5th house of Gambling and Risk-Taking which creates potentials for: reality vs imagination, sudden recognition of a difficult situation, coming down to earth with bump, and/or liking the shades. More reading at Politico: Dual Senate Sequestration Votes Expected to Fail.